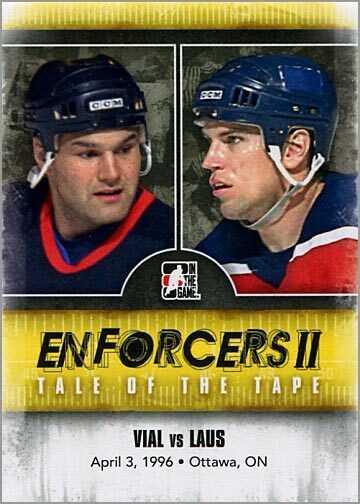 In The Game released their inaugural Enforcers trading card set during the 2011-12 season. Amid the silly controversy over the “blood-and-bandages” design was a pretty good set. 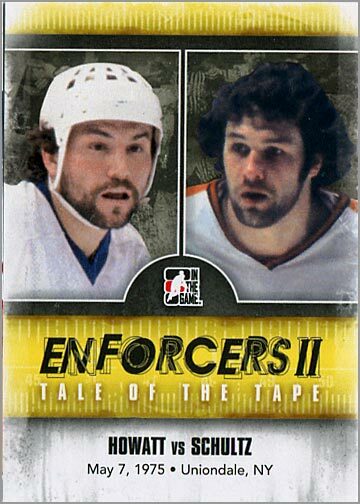 Those who like fighting and the enforcer role in hockey no doubt enjoyed the first Enforcers set, which was chock full of hits (no pun intended); each box contained five autographs and two jersey cards featuring hockey’s unsung heroes. Knowing a good thing when they see it, In The Game released Enforcers II last week. Like their first set, a 12-card box costs around $65. 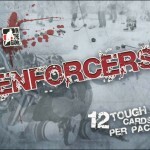 However, Enforcers II includes three jersey cards, but reduced the amount of autographed cards from five to four per box. 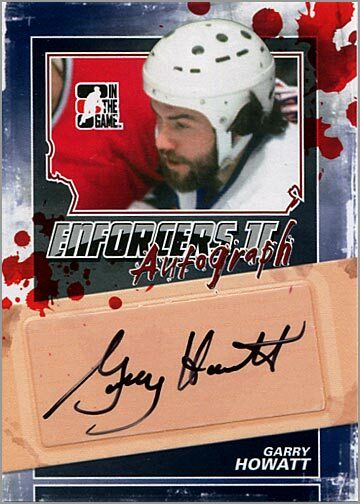 Tim Hunter – This is exactly the kind of autographed card we hope to get when opening a box of Enforcers II. 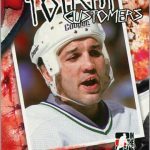 Hunter “earned” 3146 penalty minutes in 815 games! 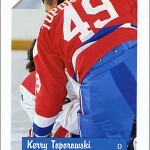 This guy was an enforcer, through and through. Bob Halkidis – On the other hand, I was surprised to get an autograph of Halkidis. He doesn’t really strike me as an enforcer, though after checking his stats he did top the 100 PIM mark four times in the NHL and another three times in the minors or in Europe. His inclusion makes sense in this set. Sami Helenius – Also known as “The Fighting Finn,” Helenius earned 200 or more penalty minutes three times in the AHL. Although he never got more than 100 PIMs per season in the NHL, he did top 100 PIMs in six seasons in SM-Liga. Garry Howatt – Standing at 5’9″ and weighing a whopping 170 lbs., Howatt was nicknamed “Toy Tiger.” He totaled 1836 penalty minutes in 720 games, and once served as an emergency linesman in an NHL game. 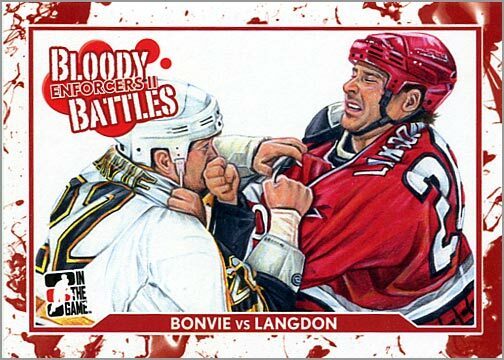 By far the best base cards in the first Enforcers set was “Bloody Battles,” which featured original artwork to depict historic NHL fights. These cards look great — my compliments to the artist — and also cleverly hide any NHL logos that ITG cannot show. “Tag Teams,” new to Enforcers II, is a great idea. 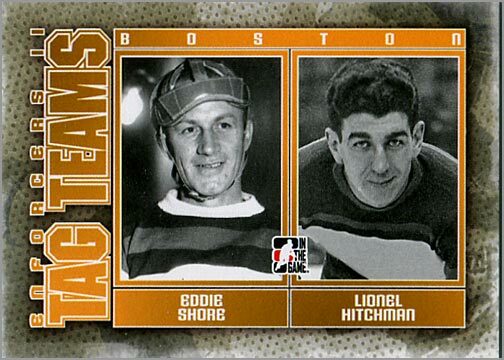 Most teams in the heyday of enforcing had two tough guys on the roster. 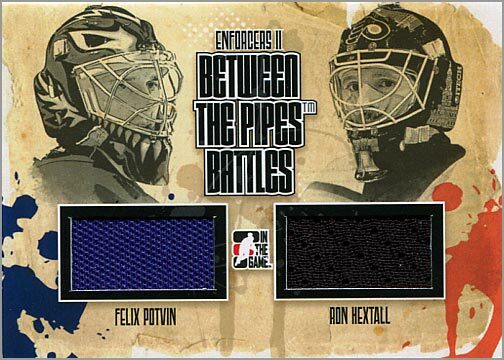 Other new subsets in Enforcers II include Crease Conflicts, 3,000 PIM Club and League Leaders. 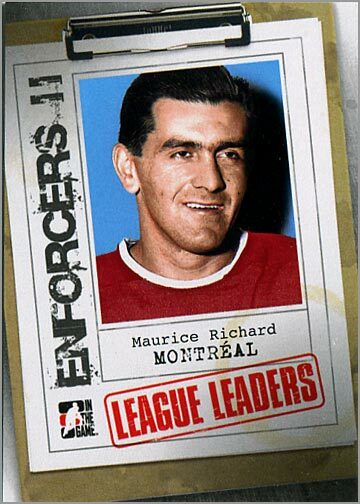 Speaking of which, Rocket Richard is not the kind of guy you’d expect to see in a set like this — but he was tops in the NHL with 112 penalty minutes in 1952-53. A clever way to get some variety of players (it can’t be all Hunter and Howatt, you know). Rounding out my base cards are two “Tale of the Tape” subset cards. The back of the card compares each player’s vitals (height, weight, PIMs, age, etc.) and recounts several key conflicts between the players. 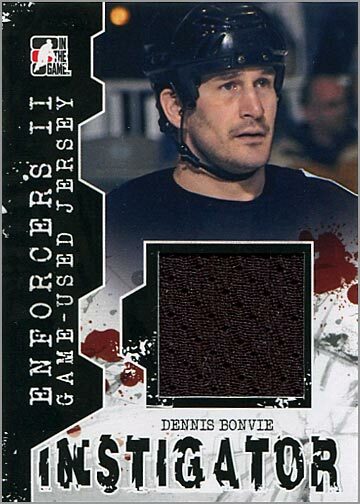 Dennis Bonvie has the most penalty minutes in a professional hockey career, including all his PIMs in the NHL and in the minors. 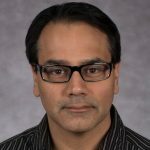 Come to think of it, this guy’s face should be on the box. Darren Langdon played 11 seasons in the NHL and accrued 1,251 penalty minutes. Sandy McCarthy played 12 seasons, earning 1,534 PIMs. 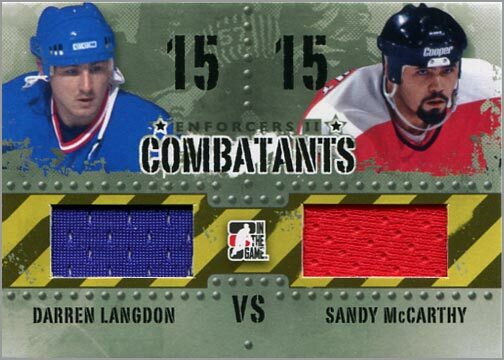 While I am not a huge fan of jersey cards, I will admit that the “Combatants” cards — with the yellow-and-black “Police Line” tape steel “rivets” looks pretty darn cool. Now this is one awesome jersey card. 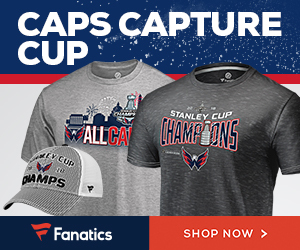 Hextall and Potvin did get into a fight — and Felix “The Cat” won, bloodying Hextall.I know, right? My only wish is that the swatch from Hexy’s jersey was orange instead of black. 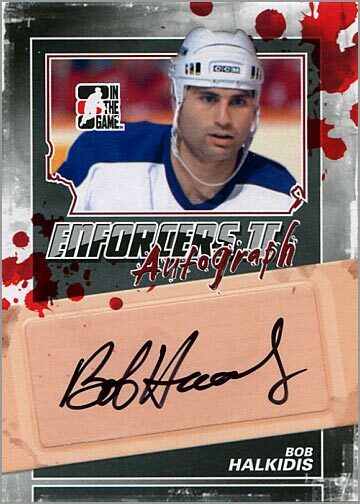 What I like about Enforcers II: The autographed cards look great and are cleverly designed — you can’t tell that they are “sticker autos” by just looking at them. The Bloody Battles cards use awesome original artwork. New base card subsets like Tag Teams, 3,000 PIMs Club, Crease Conflicts and League Leaders freshen things up and keep Enforcers II from being “more of the same.” Oh, and I like the fact that In The Game has the guts to make a set that focuses on tough guys and fighting in hockey. 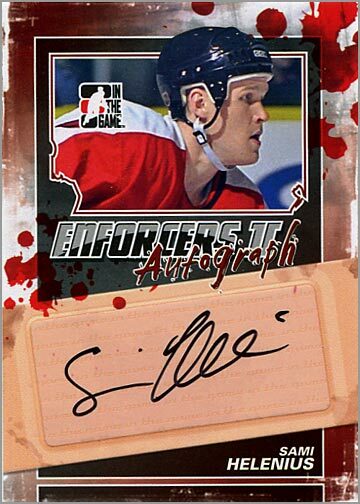 What I dislike about Enforcers II: The first Enforcers set netted you five autographed cards per box. For $65 (the original retail price), getting five autographs was an absolute steal. Enforcers II has only four autographs per box, but one more jersey card for a total of three. I think most collectors would rather have a fifth autographed card instead of more laundry. 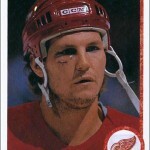 Of course, if you are not a fan of tough guys or fighting in hockey, then this set is not for you. 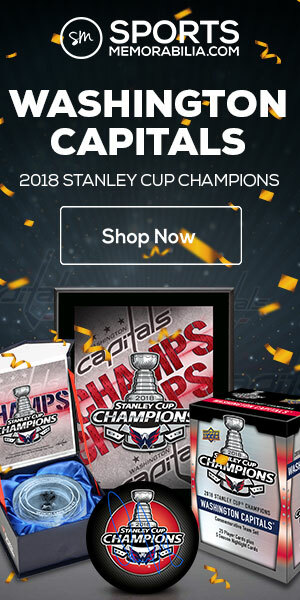 For the rest of us, though, getting four autographs and three jersey cards for around $65 is still a pretty darn good deal. 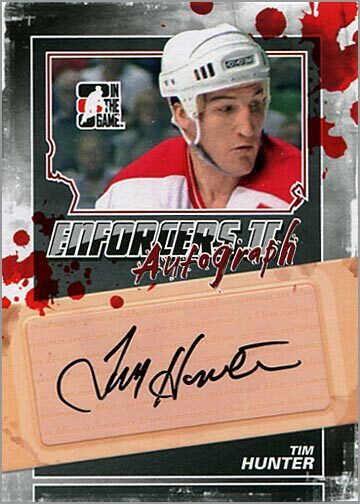 No, you won’t score any autographs of Gretzky or Lemieux here, but Enforcers II does have autographed cards of Gordie Howe, Eric Lindros, Jeremy Roenick (huh? ), and the Hanson Brothers from the movie Slap Shot: Dave Hanson, Steve Carlson and Jeff Carlson. And while the base set — at five cards per box — will be tough to complete, it is unique enough that it just might be worth a shot. Special thanks to In The Game for providing the box for this break. To see the entire Enforcers II checklist, click here. 9 times out of 10 when you watch a goalie fight, there is already a series of scrums going on around the ice. But my favorite is when the netminders drop the gloves…the rest of the fights stop and the other players just watch what unfolds. It’s great!! 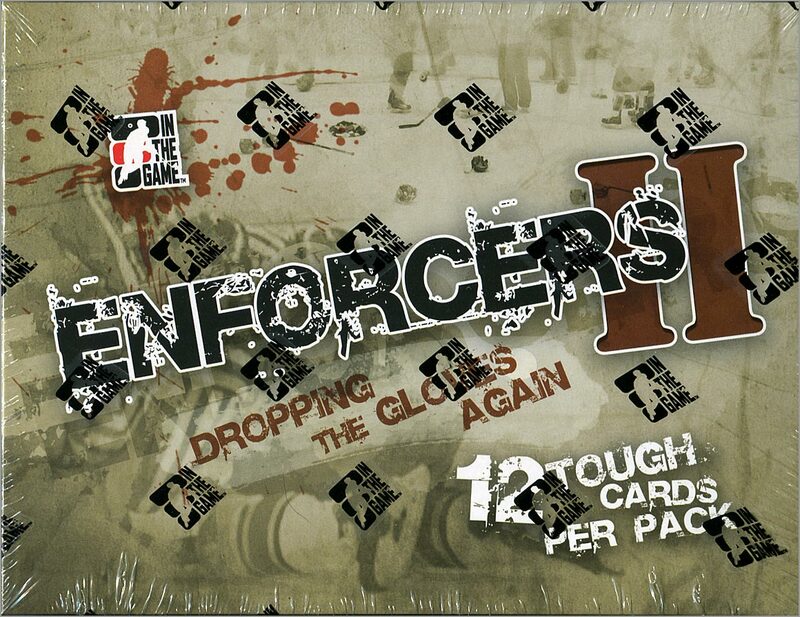 Enforcers II is another home run for ITG. I’m not sure how I feel about the continued use of the same design but considering it is basically just a continuation on the first, I suppose that is ok. I really like the addition of the Tag Teams, League Leaders, and the BTP Battles cards. Those are a really nice design. As always, ITG doesn’t disappoint.